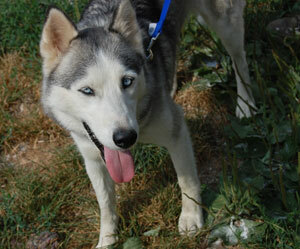 Courtney is a petite gray and white female husky with huge blue eyes. She is estimated to be 3-4 years old and was turned in by her owner after escaping numerous times…. typical for a Siberian who has been bred to run. Courtney was very frightened in the shelter; however, once she was at her foster home she quickly emerged from her shell! This little sweetie began playing and teasing with the other huskies and offering kisses to all people she meets. We are getting to know this wonderful pup and enjoy her company. She is friendly with the other dogs and loves to cuddle with people. She is crate trained, trustworthy in the house and just a sweetheart. Courtney will need to be with us another two weeks while we get to know her better and make sure we match her to her perfect home. She does need some added weight as she is very thin. She has gotten a big “thumbs up” from our vet and will be spayed and micro-chipped this week. And then Courtney will be searching for love!